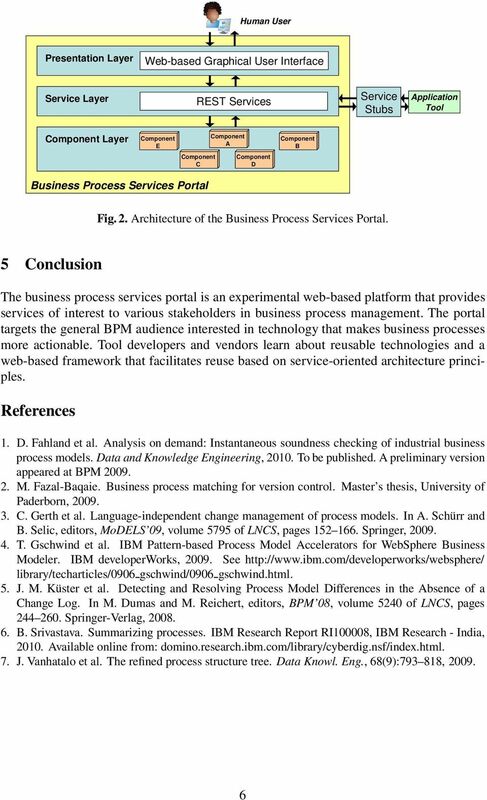 Download "A Business Process Services Portal"
1 A Business Process Services Portal IBM Research Report RZ 3782 Cédric Favre 1, Zohar Feldman 3, Beat Gfeller 1, Thomas Gschwind 1, Jana Koehler 1, Jochen M. Küster 1, Oleksandr Maistrenko 1, Alexandru Marinescu 1, Biplav Srivastava 2, Hagen Völzer 1 1 IBM Research - Zurich, Rüschlikon, Switzerland 2 IBM Research - India, New Delhi, India 3 IBM Research - Haifa, Haifa, Israel Abstract. We introduce the Business Process Services Portal as an approach to make business processes more actionable and to reduce the entrance barrier for tool developers in adopting novel process-related technologies. 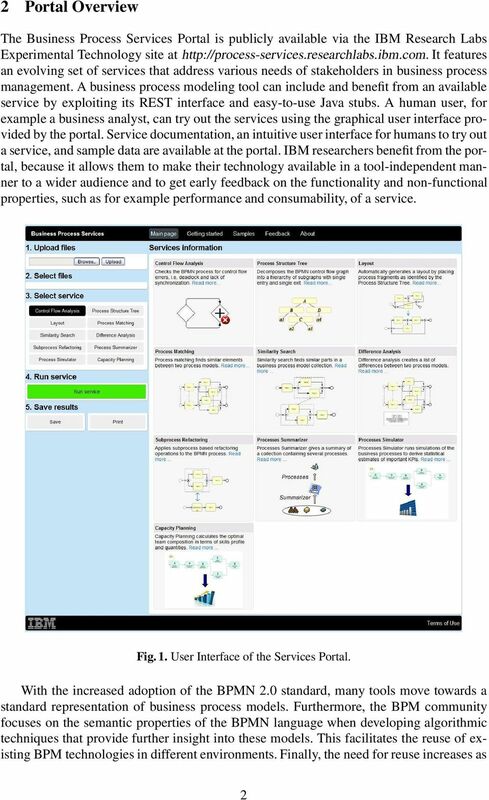 The business process services portal makes several process-related web services available in a toolindependent manner, relying on REST technology and making use of the BPMN 2.0 standard. 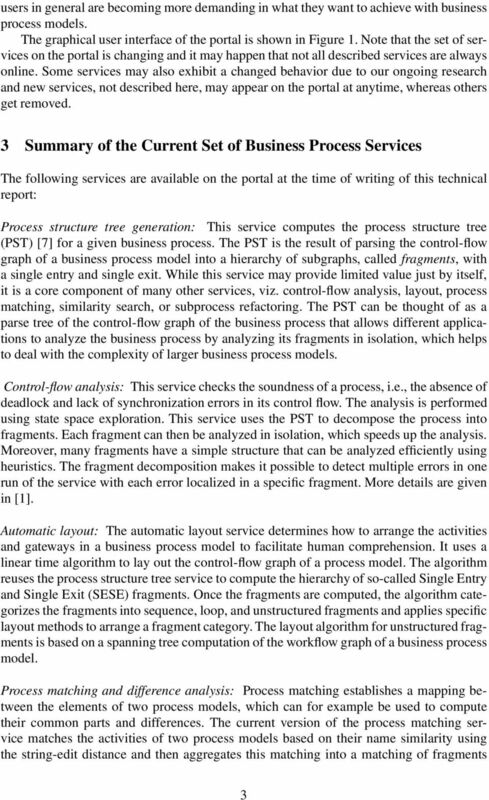 The current set of services includes for example the hierarchical decomposition, control flow analysis, comparison, simulation, and summary of business processes. The provisioning as services makes it easy for third party tools to include and further compose the technologies based on their needs. In addition, a portal providing a web-based graphical user interface helps human users to explore and familiarize themselves with the services. 1 Motivation Many interesting technologies have been developed in the past that help users gain additional insight into their business process models. 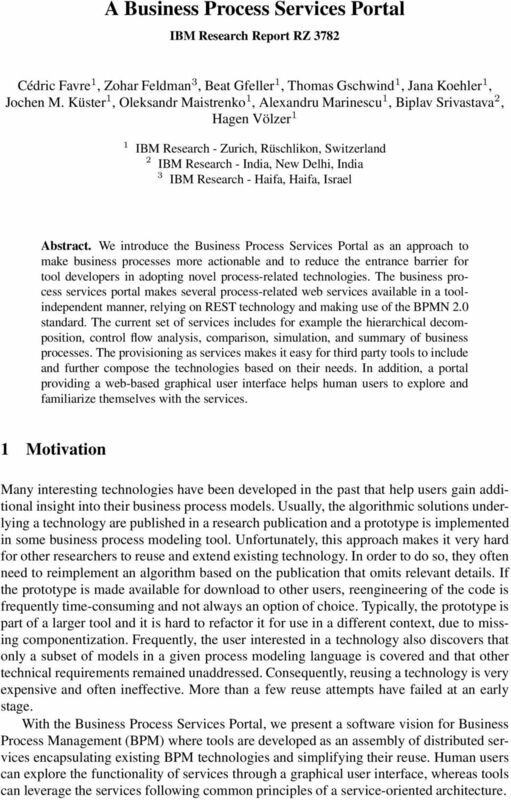 Usually, the algorithmic solutions underlying a technology are published in a research publication and a prototype is implemented in some business process modeling tool. Unfortunately, this approach makes it very hard for other researchers to reuse and extend existing technology. In order to do so, they often need to reimplement an algorithm based on the publication that omits relevant details. If the prototype is made available for download to other users, reengineering of the code is frequently time-consuming and not always an option of choice. Typically, the prototype is part of a larger tool and it is hard to refactor it for use in a different context, due to missing componentization. 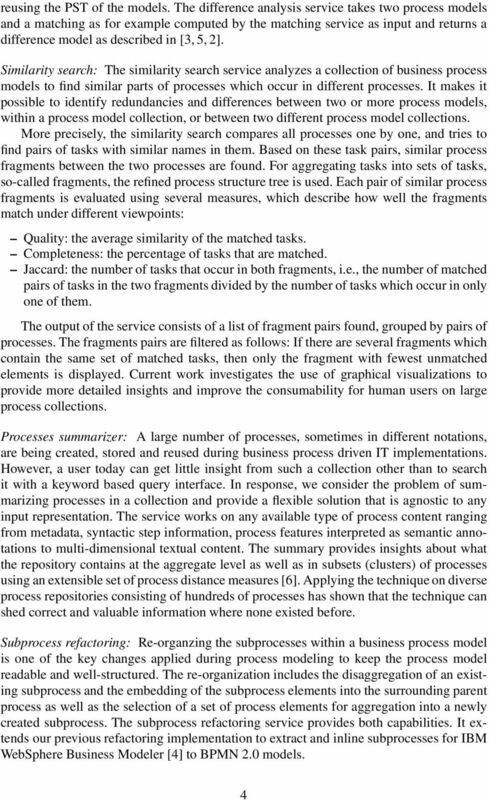 Frequently, the user interested in a technology also discovers that only a subset of models in a given process modeling language is covered and that other technical requirements remained unaddressed. Consequently, reusing a technology is very expensive and often ineffective. More than a few reuse attempts have failed at an early stage. With the Business Process Services Portal, we present a software vision for Business Process Management (BPM) where tools are developed as an assembly of distributed services encapsulating existing BPM technologies and simplifying their reuse. 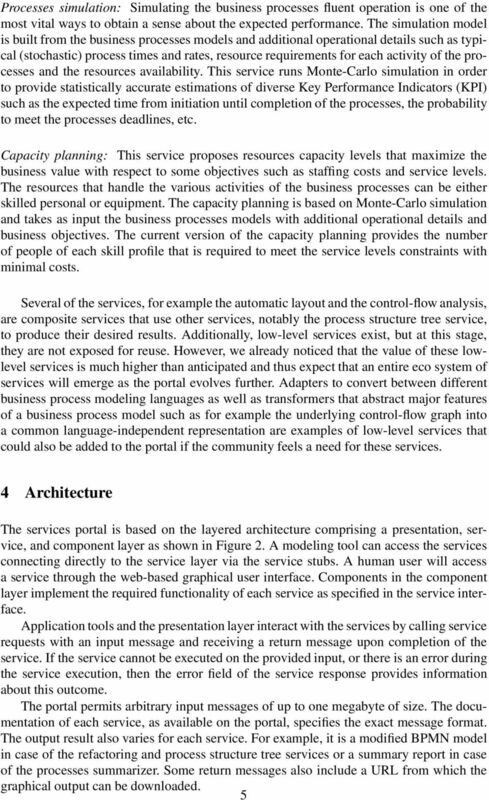 Human users can explore the functionality of services through a graphical user interface, whereas tools can leverage the services following common principles of a service-oriented architecture. 10g versions followed on separate paths due to different approaches, but mainly due to differences in technology that were known to be huge. Oracle BPM 11g Platform Analysis May 2010 I was privileged to be invited to participate in "EMEA BPM 11g beta bootcamp" in April 2010, where I had close contact with the latest release of Oracle BPM 11g. Modeling Guidelines Manual [Insert company name here] July 2014 Author: John Doe john.doe@johnydoe.com Page 1 of 22 Table of Contents 1. Introduction... 3 2. Business Process Management (BPM)... 4 2.1.